The SDPA promotes General Aviation through displays of information about general aviation and the SDPA at aviation events, placing makers promoting general aviation in South Dakota and elsewhere, writing letters to local, state, and federal entities concerning aviation interests, emailing legislative & general “alerts” to members & others, and participating in conference calls or meetings with local, state, and federal entities. Letters, Alerts, Calls, Meetings, etc. Installed four new honoree plaques in the SD Aviation Hall of Fame display. Updated SDPA display at the SD Air & Space Museum with new panels for the SD Aviation Maintenance Technology Scholarship, ACE Camp, Becker-Hansen Memorial Scholarship, SD Aviation Art Contest, New Pilot / New Mechanic, and General Aviation Proclamation signed by Governor Daugaard for 2017. 5/11/17 Visited the SD Air & Space Museum and updated panels in SDPA display, Value of General Aviation display, SD Aviation Art Contest display, and installed two plaques for the SD Aviation Hall of Fame display. 1/12/17 Updated SD Aviation Hall of Fame and SDPA displays at the SD Air & Space Museum: mounted four SD Aviation of Fame plaques with screws on the SDPA wall, replaced six SDPA display panels with updated panels, and installed seven new panels promoting the SDSU Aviation Program and seven panels promoting the LATI Aviation Maintenance Technology Program. SDPA display at the Sioux Falls Air Show on July 23-24, 2016 (John Barney left; Steve Hamilton right). Updated SD Aviation Hall of Fame display at the SD Air & Space Museum: mounted 13 SD Aviation of Fame plaques with screws on the SDPA wall, mounted five plaques on the Combat Air Crew Memorial display and installed SD Aviation Art Contest posters in display case. 4/4/16 Updated 10 SDPA displays on the SDPA wall at the SD Air & Space Museum. Showed SDPA display and Value of General Aviation display at Airport Day at Gettysburg Airport. Norma Kraemer showed historical photos display for the First Century of Flight in South Dakota. 9/21/13 SDPA & GA display Faulkton SDPA 20th Anniversary event. 9/15/13 SDPA & GA display Yankton Airport breakfast. 9/7/13 SDPA & GA display Spearfish SDAHF event. 7/25-8/5/13 SDPA & GA display Yankton “Oshkosh Promotion” Week. 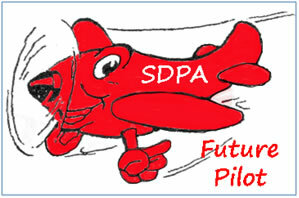 3/21/13 Purchased SDPA “Future Pilot” stickers (2-inch x 3-inch) to hand out to kids at aviation events. 1/8/13 Mailed SDPA decal (4-inch x 4-inch) to members with the January-February newsletter. 12/5/12 Updated displays at the SD Air & Space Museum (Box Elder) for SDPA: SDPA officers, Directors, Becker-Hansen Memorial Scholarship, ACE Camp, Aviation Maintenance Technology Scholarship, FLY SD Airports! Passport Program, Web Site; Value of General Aviation: added Fish & Wildlife Management, Jobs, Pipeline Patrol, Cargo / Freight Hauling, Disaster Relief, Humanitarian Response, Construction; and added new section on SD Aviation: SD State Aviation System Plan cover page, Economic Impact, Airports by Role map, List of SD Airports, Aviation Activity Summary, Terminal Operations, Weather Reporting Station map, 2010 SD Proclamation for General Aviation Appreciation Month, and 2011 SD Proclamation for General Aviation Appreciation Month. 12/5/12 Added 33 name plaques (and removed one duplicate plaque) on the SD Aviation Hall of Fame Combat Air Crew Memorial display at the SD Air & Space Museum and crosschecked name spelling. 12/1/12 Selected basic paper airplane and added SDPA logo and web address to design – for giving to children at aviation events to promote general aviation and the SDPA. The SDPA purchased a canopy for the SDPA display at the Sioux Falls Air Show (John Barney at left). The display was manned by John, Steve Hamilton, Mark Robbins, Kelsey Beving, and Dianna Torson. A rock marker was engraved and placed at the Mitchell Airport to commemorate the launch of the AirVenture Cup Race starting in 2008. (Steve & Pam Hamilton, July 25, 2012). A duplicate of the SDPA and “Value of General Aviation” displays was created and mounted on two panels of the SDPA-purchased “wall” at the SD Air & Space Museum, Box Elder, next to the display for the SD Aviation Hall of Fame (Steve Hamilton at left). Six wall panels of the “wall” were used to display photos from the “First Century of Flight in South Dakota” by Norma Kraemer. A tabletop display was created to promote the SDPA, and first used at the Ellsworth AFB event (Steve Hamilton standing, Grove Rathbun seated). The display highlighted the establishment and goals of the SDPA, officers, District Directors, scholarships, communications (newsletter and web site), and activities of the SDPA. The display also included a panel of photos depicting the “Value of General Aviation” such as air ambulance, fire-fighting, farming & ranching, business, ag spraying / seeding, flight instruction, search & rescue, hunting, tourism, air taxi / charter, recreation, aerial mapping, law enforcement, and service organizations. The display also included the Proclamation for General Aviation Appreciation Month for April 2010 signed by Governor Rounds, and June 2011 signed by Governor Daugaard. 2018, Oct 4: SDPA emailed “Congratulations” notes to Senator John Thune, Senator Mike Rounds, and Representative Kristi Noem on receiving the AOPA Freedom to Fly Awards in 2018 (announced in the October issue of AOPA Pilot magazine). 2018, Oct 2: SDPA mailed letters to Senators Thune and Rounds encouraging them to become cosponsors of the Securing and Revitalizing Aviation (SARA) Act of 2018 (S.3270). The bill proposes an Aircraft Pilot Education program, reforms provisions for designated pilot examiners, provides pilot protections, and would stop the FAA from charging for air traffic control as events like AirVenture and Sun’N Fun. 2018, Sep 12: News release on Jim Huls receiving the Wright Brothers Master Pilot Award to the Madison Daily Leader newspaper. 2018: Aug 29: Representative Noem replied to an SDPA email dated April 25, 2018, by saying that H.R. 4, FAA Reauthorization Act, was passed by the House of Representatives on April 13. The SDPA email to Noem urged her to oppose section 5 of HR 4, which created an Aerospace Management Advisory Council (essentially privatizes air traffic control). 2018, July 7: SDPA emailed Senators Thune and Rounds to become cosponsors of S.2244, and Representative Noem to come a cosponsor of H.R. 4672 – both bill titles “Promoting Women in the Aviation Workforce Act of 2017.” Both bills urge industry to “explore all opportunities, including pilot training, science, technology, engineering, and mathematics education, and mentorship programs, to encourage and support female students and aviators to pursue a career in aviation.” The bills note that women account for more than 50 percent of the national workforce, “but are significantly underrepresented in the aviation industry.” According to bill language, women represent just 2% of airline mechanics, 4% of engineers, 5% of repairmen, 26% of air traffic controllers, 18% of flight dispatchers, and 6% of pilots. 2018, June 29: Adam Wek of Senator John Thune’s office called Steve Hamilton concerning S.2506, Aviation Maintenance Workforce Development Pilot Program. Wek said that Thune has been following the issue, and language in S.2506 may be added as an amendment to the FAA Reauthorization bill prior to voting on it in late July or August. 2018, May 11: President Tim Modde mailed a letter to Wayne Jensen, manager of the FAA FSDO, Rapid City, about SDPA funding of Master Pilot and Master Mechanic Award plaques in 2018. 2018, May 11: The SDPA Executive Director emailed Senators Thune and Rounds and Representative Kristi Noem encouraging them to cosponsor respective bills in their chamber (S.2506 and H.R. 5701) establishing an Aviation Maintenance Workforce Development Pilot Program – addressing the aviation industry’s looming technical worker shortage. Passage of these bills could greatly benefit the Aviation Maintenance Technology Program at Lake Area Technical Institute at Watertown. 2018, Apr 25: SDPA emailed Representative Noem to urge her to oppose creation of the Aerospace Management Advisory Council in Section 5 of the manager’s amendment to the FAA Reauthorization bill (H.R. 4). SDPA emailed news releases about the Best Maintained Airport of the Year Awards for Basic Service (Clear Lake Airport) to the Clear Lake Courier, Small GA (McLaughlin Airport) to the Sioux County News, and Medium / Large GA (Miller Airport) to the Miller Press. 2018, Feb 17: SDPA coauthored with Skip VanDerhule (former SD Aeronautics Commissioner) a Letter to the Editor, Yankton Press & Dakotan newspaper, countering a Letter of the Editor by Neil Williams, Vice president of Airliners For America. The Williams letter extolled the privatization of Air Traffic Control. 2017, Nov 30: Submitted the news release about the new Wright Brothers Master Pilots to the Brand Valley Challenger and the Sioux Falls Business Journal. 2017, Nov 10: SDPA emailed a news release to the Sioux Falls Argus Leader newspaper on Wright Brothers Master Pilot Awards being presented to Roger Hutch8ison and Mark O’Leary, both of Sioux Falls, on Oct 26. 2017, Oct 26: Andrew Fischer of Representative Kristi Noem’s office called Steve Hamilton to say that Noem received the SDPA letter [Oct 19] with attached SD GA United letter and GA United letter opposing privatization of ATC and that she opposes the privatization of ATC. 2017, Oct 19: SDPA mailed a cover letter, SD GA United letter, and GA United letter to Representative Kristi Noem’s offices in Sioux Falls, Rapid City, Watertown, and Washington, DC – opposing the privatization of air traffic control. 2017, Oct 2-10: SDPA contacted 43 general aviation businesses and organizations in South Dakota to solicit support for a “SD GA United” letter to SD Congressional representatives urging their opposition to privatization of Air Traffic Control. As of Oct 10, 21 businesses or organizations have signed on supporting the letter. 2017, Oct 1: SDPA sent a news release on the induction of four South Dakotan aviators into the SD Aviation Hall of Fame to the Pierre Journal along with three photographs. 2017, Sep 25: SDPA sent a news release about the SD Aviation Art Contest to 45 SD media outlets. 2017, Sep 23: SDPA sent a check for $500 to the Alliance for Aviation Across America for advertising the “Sully” Sullenberger video opposing the privatization of Air Traffic Control as proposed in HR 2997. 2017, Sep 7: SDPA received a reply from Senator John Thune concerning our letter dated June 24 urging him to support the FLIGHT Act (S. 1320). Senator Thune said that the vast majority of the FLIGHT Act was incorporated in the FAA Reauthorization Act of 2017 (S. 1405), which passed his Commerce, Science and Transportation Committee on June 29. 2017, Sep 6: Tim Modde and Steve Hamilton participated in a conference call with NBAA, AOPA, EAA, and over a hundred of other general aviation organizations to hear presentations by NBAA president Ed Bolen, EAA president Jack Pelton, AOPA president Mark Baker, HAI president Matt Zuccaro, and executive vice president of Government and External Affairs of the Natiional Air Transportation Assocaition William “Bill” Deere concerning HR 2997 (21st Century Aviation Innovation, Reform and Reauthorization (AIRR) Act)). 2017, Aug 31: Devine Osting of the Alliance for Aviation Across America called Steve Hamilton to garner support against the privatization of Air Traffic Control. He was soliciting names of individuals who could counter recent media guest commentaries supporting the privatization of Air Traffic Control. Tim Modde and Steve Hamilton participated in a conference call with NBAA, AOPA, EAA, and over a hundred of other general aviation organizations to hear presentations by NBAA president Ed Bolen, EAA president Jack Pelton, Representative Todd Rokita (R-IN), and AOPA president Mark Baker concerning HR 2997 (21st Century Aviation Innovation, Reform and Reauthorization (AIRR) Act)). SDPA received a reply to our letter dated May 30 to Representative Noem opposing the inclusion of air traffic control privatization in the president’s proposed budget for Fiscal Year 2018. Noem wrote that she would keep our concerns in mind when the House works through the appropriations process. 2017, June 30: SDPA signed a letter along with 33 other general aviation organizations opposing HR 2997, AIRR (21st Century Aviation Innovation, Reform and Reauthorization) Act of 2017 – FAA Reauthorization Act, which privatizes air traffic control. 2017, June 27: Tim Modde participated in a conference call led by NBAA president Ed Bolen with numerous other alphabet groups to discuss the inclusion of ATC privatization in the House version of the FAA Reauthorization bill (but not in the Senate version). 2017, June 24: SDPA sent letters to Senator Thune, Senator Rounds, and Representative Noem urging them to support the FLIGHT Act (Forward Looking Investment in GA, Hangars and Tarmacs bill; S 1320 and HR 2879). 2017, Jun 19: Steve Hamilton had a conference call with Jessica McBride (Legislative Director, Office of Senator Thune) and Adrian Arnakis (Deputy Staff Director, Senate Commerce, Science and Transportation Committee) concerning provisions in the FAA Reauthorization bill for FY 2018. 2017, Jun 8: SDPA send a news release to 45 SD media outlets announcing and promoting the ACE Camp at South Dakota State University, Brookings. 2017, May 30: SDPA send letters to Senators Thune and Rounds and Representative Noem urging them to oppose proposals in the President’s budget for 2018 to reduce FAA funding and privatize air traffic control services funded by user-fees. SDPA sent a letter to Representative Kristi Noem urging her to become a co-sponsor of The Fairness for Pilots Act (HR 2107) introduced in the House on April 20 by Rep. Sam Graves. SDPA sent letters to Senators Thune and Rounds urging them to become co-sponsors of The Fairness for Pilots Act (S 755) introduced in the Senate on March 29 by Senator James Inhofe. 2017, Apr 7: Andy Fisher of Representative Kristi Noem’s office called Steve Hamilton to say the she was opposed to the privatization of Air Traffic Control services. 2017, Apr 7: Joe Bliss of Senator Mike Rounds’ office called Steve Hamilton to say the Senator would keep our thoughts about opposing the privatization of Air Traffic Control in mind when the issue comes before Congress. 2017, Apr 3: SDPA distributed news releases about the three Best Maintained Airport Awards for Howard, Canton, and Hot Springs to respective local newspapers. 2017, Mar 31: SDPA endorsed a letter written by the Alliance for Aviation Across America requesting a meeting in SD with Senator John Thune to discuss the future of the FAA Reauthorization Bill, including the privatization of air traffic control. 2017, Feb 22: SDPA sent letters to Senators Thune and Rounds and Representative Noem urging them to oppose legislation privatizing Air Traffic Control. 2016, Nov 4: SDPA emailed a Letter to the Editor to 46 SD media outlets requesting information about the SD Pilots Association that existed in the late 1930s. 2016, Oct 25: SDPA emailed a news release about the South Dakota Aviation Art Contest to 46 SD media outlets including newspapers, TV, and radio. 2016, Oct 16: SDPA send a news release to the Brookings Register announcing Brad Schmidt of Brookings earning the Bronze and Silver Level Awards in the FLY SD Airports! Passport program. SDPA send news releases to newspapers on Master Pilot Awards being presented to Jerry Ellingson of Lake Preston (Brookings Register), Denny Lewis of Hot Springs (Hot Springs Star), Jerry Mitchell of Rapid City (Rapid City Journal), and Lynn Riedesel of Brookings (Brookings Register). 2016, Sep 13: SDPA posted four photos and captions to the SDPA Facebook page: (1) Merle Vig receiving an Honorary LifeTime Membership; (2) John O’Connell gave an outstanding presentation on his experience as a medevac helicopter pilot in the highlights of Vietnam, (3) Jerry Ellingson, Lynn Riedesel, Denny Lewis, and Jerry Mitchell receiving FAA Wright Brothers Master Pilot Awards – all on September 10 at Black Hills Airport, Spearfish, and Lydia Anderson of Sioux Falls was selected to receive the Becker-Hansen Memorial Scholarship. Steve Hamilton (SDPA), Larry Cooper (Huron Airport Manager), and Cody Roggatz (Aberdeen Transportation Director and President of the SD Airport Management Association) met with Senator Mike Rounds at Huron Airport to discuss aviation issues including the recently passed FAA Re-authorization, which included Third Class Medical reform; Pilots Bill of Rights 2; Passenger Facility Charges; and Essential Air Service. 2016, July 19: Jessica from Senator John Thune’s office called Steve Hamilton to acknowledge the “Thank You” email sent on July 18. 2016, Apr 10: Steve Hamilton emailed news releases and photos on the Best Maintained Airport Awards to the local newspapers for the winners: Basic Airport Award to Arlington Airport (Arlington Sun newspaper), Small GA Airport Award to DeSmet Airport (DeSmet News newspaper), and Medium / Large GA Airport Award to Winner Airport (Winner Advocate newspaper). 2016, Mar 4: President Tim Modde was called by a staffer in Representative Noem’s office to discuss SDPA concerns with the House’s bill on FAA Reauthorization (HR 4441). 2016, Feb 22: President Tim Modde wrote letters to Senator John Thune, Senator Mike Rounds, and Representative Kristi Noem expressing the concerns of SDPA with the privatization of ATC. Tim Modde & Steve Hamilton had a conference call with Jessica McBride, Legislative Assistant for Senator John Thune, and Bailey Edwards, staffer on the Senate Commerce, Science and Transportation Committee about the FAA Reauthorization bill. SDPA stated its opposition to the privatization of Air Traffic Control (ATC). Edwards floated the idea of including in the legislation the provision that the 11-member board (of which two seats would be general aviation representatives) would have to vote unanimously for setting fees for ATC services. 2016, Feb 2: Mark Johnston, Manager of Senator Rounds’ office in Sioux Falls, called Steve Hamilton to acknowledge SDPA’s concerns about the privatization of air traffic control in the draft FAA Reauthorization bill being discussed. Mark noted the Rounds is watching the action of Thune’s Commerce committee on the reauthorization bill. 2016, Jan 29: Andrew from Representative Noem’s office called Steve Hamilton to say that Noem traditionally has opposed user fees for general aviation and will keep our concerns in mind about privatizing air traffic control funded by user fees when dealing with the FAA Reauthorization bill. 2016, Jan 19: SDPA contacted Senators John Thune and Mike Rounds and Representative Kristi Noem and urged them to reject language in the draft FAA Reauthorization bill concerning privatization of air traffic control and creating a new air traffic regulator funded by user fees. 2016, Jan12: SDPA President Tim Modde emailed a letter to the SD Civil Air Patrol Wing Commander concerning coordinating events with SDPA to avoid conflicts between the two organizations. 2015, Dec 10: SDPA emailed a news release on the SD Aviation Art Contest to 47 media outlets in SD. 2015, Nov 23: SDPA sent a letter to Governor Daugaard asking him to fill the vacancy on the Aeronautics Commission created by the resignation of Richard Pearson on April 30, 2015. 2015, Nov 17: SDPA emailed a “Letter to the Editor” of the Gregory Times Advocate about the SDPA holding a meeting at the airport on November 14, ten planes flying in for the meeting, thanked the City of Gregory for the use of the GA terminal, and thanked airport manager Mike Klarenbeek for facilitating the meeting. 2015, Nov 16: SDPA mailed a “thank you” letter to the City of Gregory for the use of the GA terminal and providing lunch for the SDPA meeting at the airport on November 14. The letter included a “thank you” to airport manager Mike Klarenbeek for facilitating the meeting. 2015, Nov 16: SDPA emailed Representative Kristi Noem urging her support of Representative Mike Pompeo’s amendment to the Highway Bill. The Pompeo amendment requires the Government Accountability Office to conduct a study of diversions of non-commercial jet fuel tax revenues to the Highway Trust Fund that are depriving the Airport and Airways Trust Fund of much needed funding. SDPA emailed Senator John Thune urging him (fourth time) to support and co-sponsor the Pilots Bill of Rights 2 (S. 571), which will be discussed in the Senate Committee on Commerce, Science, and Transportation that the Senator Thune chairs. 2015, Oct 8: SDPA sent a letter supporting the construction of a paved crosswind runway (5-23) at Black Hills Airport – Clyde Ice Field, Spearfish, to Lawrence County, City of Spearfish, and airport manager Ray Jilek. 2015, Sep 18: SDPA sent letters to Senator Thune, Senator Rounds, and Representative Noem urging them to oppose privatization of Air Traffic Control services as proposed by Representative Bill Shuster (R-PA). 2015, Sep 17: The SDPA sent a news release on Don Blumenberg receiving the Wright Brothers Master Pilot Award to the Mitchell Daily Republic newspaper. 2015, Sep 17: The SDPA sent a news release on Denny Martens being inducted into the SD Aviation Hall of Fame to the Vermillion Plain Talk newspaper. 2015, Jul 28: SDPA President Tim Modde emailed Senator John Thune urging him to vote for the Pilots Bill of Rights 2 (S. 571). 2015, Jul 23: SDPA signed a letter written by Josh Grossman (Alliance for Aviation Across America), along with others, requesting a meeting this summer with Senator John Thune to discussion aviation issues such as supporting FAA reauthorization and opposing privatization of Air Traffic Control. 2015, Jun 30: SDPA signed a letter from the Alliance for Aviation Across America that was sent to Senator John Thune urging him to support the reauthorization of the FAA and to avoid the privatization of Air Traffic Control and its dependence on users fees for operation. The letter was also signed by several mayors and airport managers in SD. 2015, Jun 22: SDPA Executive Director answered questions about the FLY South Dakota Airports! Passport program for a reporter from the Sioux Falls Argus Leader newspaper for a news story. SDPA sent a “Thank You” to the Commander, Ellsworth AFB, via Public Relations, for the presentation by Lt. Col. Jim Ross on the implementation of the Powder River Training Complex, and assistance provided by MSgt John Barton, Public Relations, and Mr. George Stone, Air Space Manager. SDPA sent a news release about Mayor Huether’s proclamation to 22 media outlets in Sioux Falls and to 8 aviation organizations in the Sioux Falls area. SDPA worked with Julie Wilson, Mayor’s Executive Assistant to Sioux Falls Mayor Mike Huether, to prepare a Mayoral Proclamation for General Aviation Appreciation Month for the month of June (proclamation signed June 9). SDPA mailed copies of Governor Daugaard’s Executive Proclamation establishing June 2015 as General Aviation Appreciation Month in South Dakota to 51 airports with bulletin boards. SDPA emailed airport managers at 22 SD airports to encourage them to sign on to the AAAA letter to Senator John Thune (letter described above). SDPA signed on to the letter from AAAA to Senator John Thune urging him to keep SD airports in mind when considering the reauthorization of the FAA, and to avoid the privatization of Air Traffic Control and its dependence on user fees for operation. SDPA mailed a letter to the SD Aeronautics Commission encouraging them to contact Senator John Thune and Representative Kristi Noem and ask them to become co-sponsors of the Pilot’s Bill of Rights 2 (S.571). Also to thank Senator Mike Rounds for cosponsoring S.571. SDPA emailed Senator John Thune a second time urging him to become co-sponsor of Senate Bill 571 (Pilot’s Bill of Rights 2). Also emailed Representative Kristi Noem a second time urging her to co-sponsor House Bill 1062 (Pilot’s Bill of Rights 2). Emailed Senator Mike Rounds thanking him for becoming a co-sponsor of S.571. SDPA emailed news releases on the Best Maintained Airport of the Year 2014 awards to local newspapers: Basic Service award to Arlington (Arlington Sun), Small GA award to DeSmet (DeSmet News), and Medium / Large GA award to Belle Fourche (Butte County Post and Black Hills Pioneer). SDPA mailed a letter to Kevin Tveidt (SD DOT) concerning the FAA’s Policy and Procedures Concerning the Use of Airport Revenue: Proceeds from Taxes on Aviation Fuels published in the Federal Register (66282), on November 7, 2014. SDPA emailed an alert about the Pilot’s Bill of Rights 2 (S.571) to 467 emails. The SDPA email was also distributed to email lists for the Yankton Regional Aviation Association (124 contacts; southeastern SD), SDPA Facebook (67 contacts), Dwayne LaFave’s contacts (330 contacts; ultralight flyers and eastern SD), Chris Funk’s contacts (93 contacts; Madison / Brookings area), and Sioux Falls EAA Chapter 289 by Gary Pelach (118 contacts). Molly Benkert of the Black Hills EAA Chapter 39 independently distributed an email about the Pilots Bill of Rights 2 (68 contacts) – for a grand total of 1,267 contacts, with some overlap, of course. SDPA emailed Senators John Thune and Mike Rounds and urged them to become co-sponsors of Senate Bill 571 (Pilot’s Bill of Rights 2). Also emailed Representative Kristi Noem and urged her to co-sponsor House Bill 1062 (Pilots Bill of Rights 2). SDPA Legislative Alert emailed to 470 addresses concerning three bills: SB157 (an Act to make an appropriation to the state Aeronautics Fund – returns $3.033,581 swept for the Aeronautics Fund in the 2010 Legislature). HB1098 (an Act to authorize extended terms of lease for airport facilities -- changes maximum lease from 25 years to 50 years). HB1139: (an Act to revise certain procedures for competitive sealed bids by public purchasing agencies – allows sealed bids for airport improvement projects to be valid for greater than 30 days at the bidder’s discretion. SDPA mailed Senator Mike Rounds a letter urging him to become a member the General Aviation Caucus in the U.S. Congress (Senator Thune and Representative Noem are members of the caucus). SDPA sent a letter urging Senator Mike Rounds to become a co-sponsor of the General Aviation Pilot Protection Act (S 2103), which concerns eliminating the Third Class Medical. SDPA emailed a news release on the SD Aviation Art Contest to 47 SD media outlets. SDPA emailed a new story about "Federal Regulatory Preemption in UAS Arena" (Aero News Network) to SD Senator Jeff Monroe (Pierre) who has been following the issue and may introduce legislation in the 2015 SD Legislature. 2014, Oct 11: SDPA sent an email to Senators Tim Johnson and John Thune urging them to become co-sponsors of S. 2103 (General Aviation Pilot Protection Act), and an email to Representative Kristi Noem urging her to become a co-sponsor of HR 3708 (General Aviation Pilot Protection Act). 2014, Oct 6: SDPA submitted comments to docket number FAA-2014-0463 (policy on the nonaeronautical use of airport hangars). SDPA emailed a news release to 47 SD media outlets concerning the SD Aviation Hall of Fame event held at Spearfish and information about the inductees into the SD Aviation Hall of Fame and Combat Air Crew Memorial. SDPA emailed a news release to 47 SD media outlets concerning the Open House at Mitchell Airport for the AirVenture Cup Race and presentation by Mark Baker, President of the Aircraft Owners and Pilots Association set for July 26. 2014, Jul 18: SDPA presented congratulations letter to Matt Guthmiller of Aberdeen, SD, on completing his solo around-the-world-flight, along with free membership in the SDPA. 2014, Jul 14: SDPA Letter-to-the-Editor of Potter County News about Airport Day at Gettysburg Airport. SDPA mailed copies to 50 SD airports with bulletin boards of the Executive Proclamation signed by Governor Dennis Daugaard proclaiming May 2014 as General Aviation Appreciation Month in South Dakota. SDPA sent an email to Senators Tim Johnson and John Thune urging them to support Senate Bill 1941, which established requirements for the adoption of any new or revised requirement providing for the screening, testing, or treatment of an airman or an air traffic controller for a sleep disorder, and or other purposes. SDPA sent a letter to the SD Aeronautics Commission urging them to continue funding of the SD Aerospace Career and Education Camp held at South Dakota State University, Brookings. SDPA sent a letter to the SD Aeronautics Commission urging them to change the cost share to 8% state and 2% airport sponsor for the current funding year – due to the return of $500,000 to the SD Aeronautics Fund when SD Senate Bill 53 was signed by Governor Daugaard on March 26. ($3,533,581 had been swept for the SD Aeronautics Fund by the 2010 SD Legislature via SD House Bill 1083 and SD Senate Bill 49). SDPA sent an email to Senators Tim Johnson and John Thune urging them to become co-sponsors of Senate Bill 2103 (General Aviation Pilot Protection Act), and an email to Representative Kristi Noem urging her to become a co-sponsor of House Bill 3708 (General Aviation Pilot Protection Act). 2014, Feb 12: SDPA Executive Director emailed each of the nine members of the SD Senate Appropriations Committee urging them to support passage of SB86 (an act to make an appropriation to the Aeronautics Fund -- $3,533,581, which was swept in the 2010 SD Legislature). SDPA Legislative Alert #2 was emailed to over 400 addresses and called for immediate action on Senate Bill 86 (an act to make an appropriation to the state aeronautics fund (i.e., return $3,533,581 swept by the 2010 SD Legislature). The Alert also gave the status of HB1042, HB1043, HB1144, HB1178, and SB80. SDPA Legislative Alert #1 was emailed to over 438 addresses concerning four aviation related bills in the 2014 South Dakota Legislature: HB1042, HB1043, SB80 and SB86. The Alert was also sent to the SDAA, Black Hills EAA Chapter 39, Tea EAA Chapter 289, and two other email lists for distribution. 2013, Oct 10: SDPA sent letters to 48 mayors with airports encouraging them to sign the “Mayors Petition to President Obama” on the Alliance for Aviation Across America web site. The petition opposes the inclusion of user fees ($100 fee for air traffic control services) in the Administration’s FY2014 Budget. 2013, Oct 8: SDPA sent letters to Senators Thune and Johnson and Representative Noem urging them to oppose the inclusion of a user fee and change the depreciation schedule in the proposed FY2014 Administration Budget. 2013, Sep 4: Senator Tim Johnson replied concerning the Small Aircraft Revitalization Act of 2013, that he would keep the thoughts of the SDPA in mind when the bill comes up for a vote in the Senate. 2013, Aug 13: SDPA President John Barney helped organize and lead GA Roundtable with Senator John Thune in Sioux Falls at Landmark Aviation. 2013, May 28: The SDPA emailed Senators Thune and Johnson and Representative Noem urging their support of the Small Aircraft Revitalization Act of 2013. 2013, May 20: Governor Daugaard signed the proclamation making June 2013 General Aviation Appreciation Month in South Dakota and sent the original proclamation to the SDPA. 2013, May 12: The SDPA requested that Governor Daugaard sign and issue a Proclamation about the importance of General Aviation in South Dakota. SDPA also requested that the Yankton Regional Aviation Association, Rapid City EAA Chapter 39, Sioux Falls/Tea EAA Chapter 289, and South Dakota Aviation Association also email Governor Daugaard asking him to issue the Proclamation. 2013, May 7: The SDPA reviewed an updated General Aviation Proclamation prepared by the Alliance for Aviation Across America (Josh Grossman), which was forwarded to SD Governor Daugaard. 2013, Apr 20: Sent letter to SDSU, Aviation Program, saying the SDSU Safety Initiative proposal deserves consideration. 2013, Apr 16: Sent letter to U.S. Representative Noem urging her to oppose the inclusion of “user fees” in the Administration’s 2014 Budget proposal. REPLY: Rep. Noem replied on April 26 that she opposed user fees, and signed a bipartisan letter to the President opposing user fees. 2013, Apr 2: Sent news release on Master Pilot Awards to the Argus Leader, Sioux Falls, for Jim Eisenmenger and Peter Hegg; the Yankton Press & Dakotan, Yankton Observer, and Kolberg-Pioneer for Eisenmenger; and Hegg Companies for Hegg – along with photos. 2013, Mar 31: Sent news release on Best Maintained Airport Awards to Grant County Review, Milbank (Best Maintained Medium General Aviation Airport), the DeSmet News, DeSmet (Best Maintained Small General Aviation Airport), and the Lyman County Herald, Presho (Best Maintained Basic Service Airport). The news releases included a photo of Jason Engbrecht, SD DOT Office of Air, Rail & Transit, presenting the awards to the airport managers. 2013, Feb 23: Email to legislative assistants for Senators Tim Johnson and John Thune and Representative Kristi Noem concerning opinion of SDPA member on expansion of the Powder River MOA and possible drone use. 2013, Feb 15: SDPA Legislative Alert #2 to members and others concerning SD SB224; House Bill 1246 (an act to authorize certain aerial pesticide applicators to apply pesticide on their own property), and House Bill 1247 (an act to make an appropriation ($3,533,581) to the state Aeronautics Fund (those funds were “swept” from the Aeronautics Fund in 2010 by the Legislature for non-aviation uses). 2013, Jan 31: SDPA Legislative Alert #1 to members and others (~610 email addresses) concerning SD Senate Bill 224 (an act to revise and repeal certain aviation laws and to increase some related fees in Title 50 – Aviation). 2012, Nov 17: SDPA notified the SD Office of Aeronautics of an incorrect frequency [122.8] for activating the runway lights at Parkston Airport that was listed in the FAA Airport / Facility Directory, Omaha Sectional Chart, and AirNav, and Jason Engbrecht corrected the problem (the correct frequency [122.9] was given in the 2011-2012 SD Airport Directory). 2012, Nov 7: SDPA sent a “Congratulations” letter to Senator John Thune for receiving the Hartranft Award from AOPA for his tireless work to protect and enhance General Aviation as an elected official. 2012, Nov 7: SDPA sent a “Congratulations” letter to Representative Kristi Noem on her reelection to the U.S. House. 2012, Oct 17: SDPA received a letter from Representative Kristi Noem that stated, “I wanted to update you on legislation I supported to protect pilots from unfair FAA investigations” – The Pilot’s Bill of Rights. 2012, Sept 27: SDPA received a letter from Representative Kristi Noem that stated, “I recently supported legislation to prevent the European Union from imposing taxes on U.S. airlines.” H.R. 2594, The European Union Emissions Trading Scheme Prohibition Act would prevent U.S. airlines from being taxed under an emissions trading system while flying to Europe. 2012, Sep 24: SDPA Executive Director sent a “Letter to the Editor” to the Bloomfield (Nebraska) Monitor newspaper lauding the Bloomfield Airport Breakfast and Young Eagle Rally and the major event sponsor Bloomfield Ag & Aerial Spraying. 2012, Jun 13: “SDPA Alert” emailed to members concerning commenting on proposed changes to third class medical certificates proposed by AOPA and EAA. 2012, Apr 23: Email to Representative Noem urging opposition to Representative Michael Turner (R-Ohio) amendment to the House National Defense Authorization Act (HR 4310), which would bar the Department of Defense from loaning or gifting any U.S. military aircraft or parts to any entity except those that would put the aircraft on static display. 2012, Apr 23: Email to Representative Noem urging support and co-sponsorship of a letter from House GA Caucus supporting closing a loophole in the federal regulations that is moving Aviation Fuel Tax revenue to the Highway Trust Fund. 2012, Feb 17: Letter to SD Senator Tom Hansen supporting SD HB1209, which would stop double taxation of components used it built home-built aircraft. 2012, Feb 17: Letter to SD Representative Wink supporting SD SB46 to allow funding of a hangar for SDSU Aviation program. Copy to 8 members of the House Appropriations Committee and 15 other Representatives. 2012, Feb 4: Letter to SD Representative Willadsen supporting SD HB1209, which would stop double taxation of components used to built home-built aircraft. Copy to 14 members of the SD House Taxation Committee, and Representatives Romkema, Turbiville, Venner, and Senator Tom Nelson. 2012, Jan 26: Letter to Representative Noem urging her to co-sponsor the Pilot’s Bill of Rights. 2012, Jan 25: Letter to Representative Noem opposing “user fees” in the proposed Administration’s Budget. 2012, Jan 16: Letter to FAA Airports District Office, Bismarck, requesting the FAA take action to resolve the “shooting range” issue at Custer County Airport. 2012 Jan-Feb: Six “Legislative Alerts” emailed to members on SD SB46 (SDPA supported funding of SDSU hangar), SD HB1209 (SDPA opposed double taxation on homebuilt parts), SD HB1212 (SDPA supported tort liability), SD HB1244 (SDPA supported returning $3.533M from General Fund to Aeronautics Fund). 2011, Oct 17: Letter to SD Aeronautical Commission requesting they discuss funding for three AOPA Air Safety Institute safety seminars in SD. 2011, Oct 13: Letter to SD Aeronautics Commission requesting they discuss funding for an SD Aeronautical Chart. 2011, Oct 13: Letter to Senators Thune & Johnson thanking them for supporting Senate Bill 1335, the Pilot’s Bill of Rights. 2011, Oct 13: Emailed Senators Thune & Johnson opposing “user fees” in President’s Jobs Bill. 2011, Jul 25: Submitted comment to Docket FCC-2011-109 opposing LightSquared’s proposed frequency use near the GPS range. 2011: Jul 15: Letter to FAA Airspace Regulations & ATC Procedures Group opposing the proposed wind turbine farm located northwest of Belle Fourche Airport. 2011, Jul 9: Letter to SD Aeronautics Commission supporting purchase of Ground Control Outlets at SD airports. 2011, Jul 7: Letter to the Editor of Platte Enterprise newspaper praising the Airport Breakfast held on July 2. 2011, Jul 5: Submitted comment to Docket FAA-2009-0481 concerning changing the requirements for third class medical certificates. 2011, Jul 1: Letter to Representative Noem, Senators Thune & Johnson to resolve threat to GPS by LightSquared. 2001, Jun 27: Emailed sample Airport Advisory Board guidelines to Denny Lewis, Hot Springs. 2011, May: Emailed SD DOT supporting General Aviation Appreciation Month in SD. 2011, Mar 2: Emailed SD Senators Tom Nelson and Eldon Nygaard to oppose SD HB1128, which would delay marking MET towers. 2011, Mar 2: One “Legislative Alert” emailed to members on SD HB1128 (SDPA supported marking of meteorological evaluation towers (MET) towers). 2011, Jan 28: Submitted comment to the docket FAA-2010-1326 supporting marking of MET towers. 2011, Jan 21: Letter to Representative Noem requesting that she become a member of the General Aviation Caucus in the U.S. House. 2010, Dec 3: Congratulations letter to Representative Noem on her election to the U.S. House. 2010, Feb 23: Letter to SD Aeronautics Commission requesting they fund three AOPA Air Safety Foundation safety seminars in SD. 2010, Jan 15: SDPA wrote a proclamation for General Aviation Appreciation Month in SD, and gained support for it from the SD Aeronautics Commission, and the proclamation was signed by Governor Rounds. 2009, Feb 16: Letter to Senator Johnson expressing concern about a proposal from the Transportation Security Administration to regulate general aviation aircraft which weigh more than 12,500 pounds. Same letter to Senator Thune and Representative Herseth-Sandlin. 2009, Feb 14: Letter to the Transportation Security Administration expressing concerns about the proposed rule that would treat general aviation aircraft weighing more than 12,500 pounds the same as commercial aircraft. Copy to Senators Thune & Johnson, Representative Herseth- Sandlin. 2009, Feb 9: One “Legislative Alert” emailed to members on SD SB137 (SDPA opposed selling four state-owned passenger planes). 2008, Nov 11: Congratulations letter to Senator Johnson on his re-election. Similar letter to Herseth- Sandlin on her re-election. 2008, Nov 3: Letter to Linda Ehrenfelt (Pierre) with attachment of sample Airport Advisory Board guidelines. 2008, Feb 2: Letter to Senator Johnson opposing “user fees” for general aviation. 2008, Feb: Four “Legislative Alerts” emailed to members on SD HB1267 concerning use of the Aeronautics Fund ($259,000) to lease, lease / purchase, or finance two planes for the University of South Dakota and South Dakota State University. 2007, Oct 20: Letter to Senator Thune opposing “user fees” for general aviation. 2007, Sep 7: Letter to Senator Thune opposing “user fees” for general aviation. Similar letter to Representative Herseth-Sandlin. 2007, Jun 7: Letter to Senator Thune opposing “user fees” for general aviation. 2007, May 11: Letter to Senators Daniel Inouye, Ted Stevens, and Thune (Senate Commerce, Science, and Transportation Committee) urging reauthorization of the FAA. 2006, Feb 5: Letter to Representative Herseth, Senators Thune & Johnson opposing “user fees” for general aviation. 2005, Oct 19: Comment on Docket FAA-2004-17005 concerning SDPA opposing making permanent all of the temporary flight restrictions existing in the Washington, DC, area. 2005, Sep 25: Email to Senators Thune & Johnson concerning SDPA opposing the takeover of the FAA’s Flight Service Stations. 2005, Sep 15: Email to Senators Johnson and Thune urging them to oppose funding for the takeover of the FAA’s Flight Service Stations by a private contractor. 2005, May 3: Letter to Representative Herseth, Senators Thune & Johnson urging support of Senate & House bills to make May 24 as National Aviation Maintenance Technician Day. 2005, May 3: Letters to Senators Johnson and Thune and Representative Herseth urging them to support and co-sponsor the Senate version of House Resolution 586 to make May 24 as National Aviation Maintenance Technician Day in the United States. 2005, Apr 27: Letter to National Geospatial-Intelligence Agency opposed to the end of public dissemination of certain Department of Defense publications like international and Caribbean en route and instrument approach charts. 2005, Apr 17: Thank you letter to Representative Herseth, Senators Thune & Johnson for introducing legislation to stop privatization of the Flight Service Stations. 2005, Mar 19: Letter to Representative Herseth, Senators Thune & Johnson opposing funding cuts to Airport Improvement Program. 2004, Nov 7: Letter to Rapid City FSDO suggesting improvements in their web site. 2004: Letter to SD Office of Aeronautics concerning discrepancies in SD Airport Directory. 2004, Sep 11: Letter to Governor Rounds requesting “Aviation Maintenance Technician Day in South Dakota in honor of Charles E. Taylor. 2004, Jun 10: Letter to Governor Rounds, Senators Daschle & Johnson and Representative Herseth opposing outsourcing of Flight Service Stations. 2004, Apr 6: Letter to Rapid City FSDO concerning use of different frequencies for CTAF and pilot- controlled lights. 2003, Dec 18: Letter to FAA, Washington, DC, on Notice of Proposed Rulemaking concerning National Air Tour Standards for charity flights & air tour operators. 2003, Dec 18: Letter to SD Aeronautics Commission about lack of facilities (shelter, restroom, phone) at many SD airports. 2003, Oct 12: Letter to City of Flandreau thanking them for constructing the new administration building with restroom and encouraging them to finish the building and repair the broke (frozen) water line. 2003, Apr 16: Letter to Senators Daschle & Johnson and Representative Janklow opposing the closure of Meigs Field. 2003, Jan 19: Letter to Governor Rounds, Senators Daschle & Johnson and Representative Janklow opposing outsourcing of Flight Service Stations. 2002: Letter on SD pilot photo identification law. Letters to Senator Johnson and Daschle urging them to support Senator Inhofe’s amendment to the FAA Reauthorization Bill known as the Hoover Bill.